Recently Topps sort of brought back the Members Only Club. You may have missed it, and I wouldn’t be surprised if you did. Basically they did an online offering to spend $200 and in return you get a few small sets across the 2019 season and some other “member” exclusives and autos. I considered joining, actually because it didn’t seem like a terrible price. I ended up not joining, but not because I lacked the desire or funds, but because I didn’t know it was a limited quantity or time-sensitive offer. I debated a bit too long and it sold out. Well, once again, I’m not one of the cool kids. Too bad. I wasn’t one of the cool kids back in the ’90s, either. That was very much due to cost. Kids can’t afford these types of memberships. Only the Burger King Kids Club types, but those didn’t come with cards. 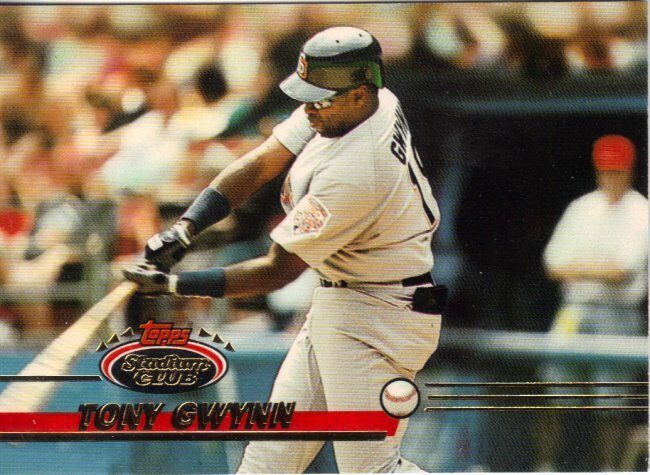 Well, even though I’m not, Tony was in the Stadium Club and had been for years. 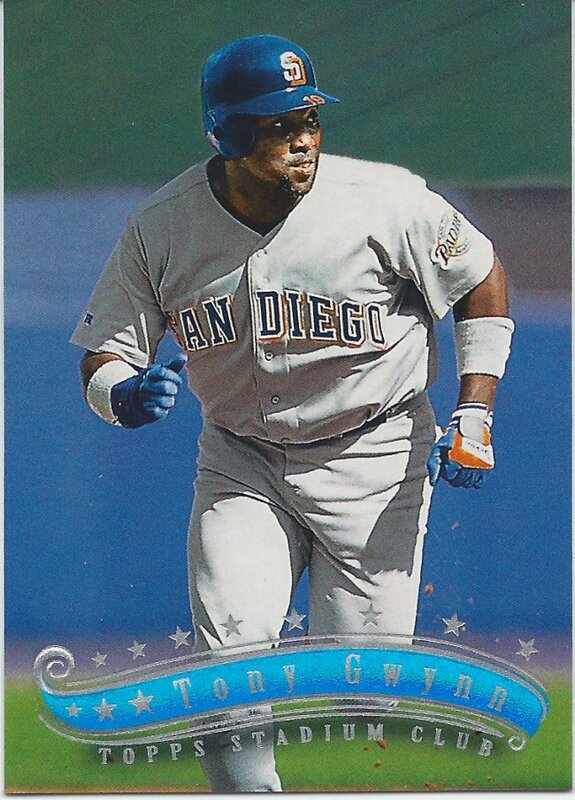 It’s surprising how few SC cards I’ve posted on here, considering Andy used to master collect the product. I love bendy bats. If I can find enough, maybe I’ll make a post about that. As you’ll see, Tony had a good run of photos through this product. I know it’s known for the photography, but not everyone is all that lucky, and it became less important over time. Like this is an example of a not-so-great one. It is for a subset, though. 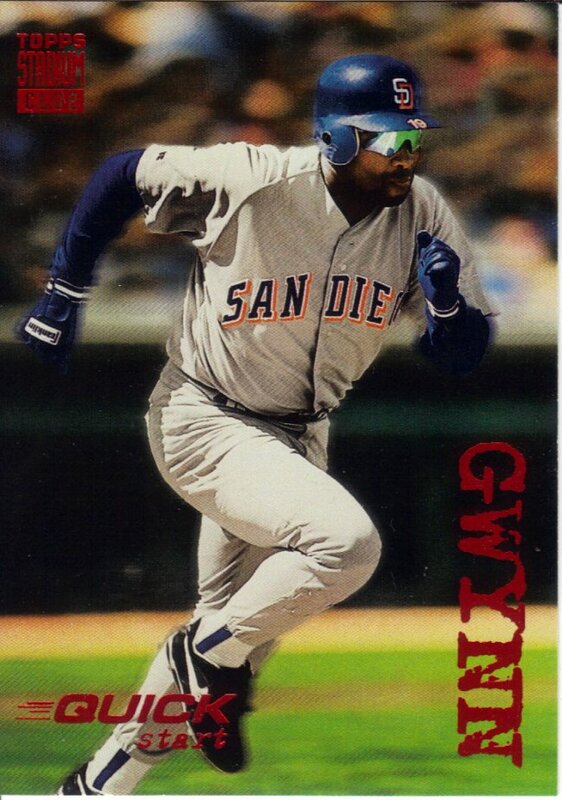 Gwynn’s never been known for his speed, and it looks like they added a motion blur to the background. That’s just an unfair advantage. I also want to know the ground rules for balls that hit the on-field bench. 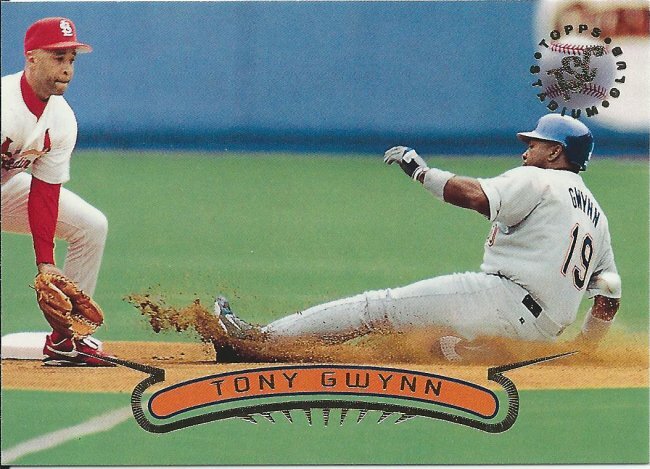 Look, even this relatively mundane act of sliding into the base looks great. 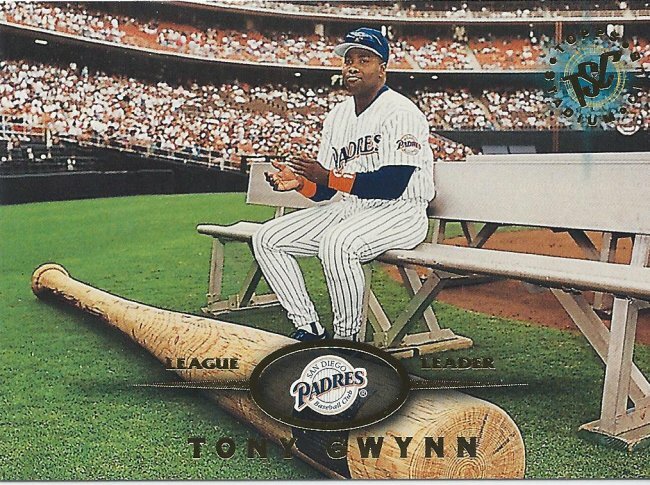 Pretty sure he’s going to be safe since that ball is hiding in front of Gwynn’s back arm. Back to the quick start, I see. 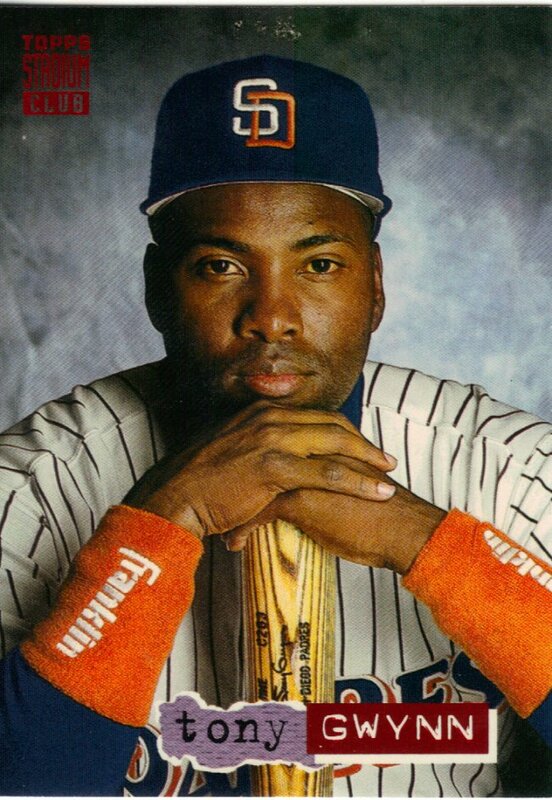 I love the embossed nameplate and it shows that even the best players don’t bat 1.000 in good SC pics. More embossed design, but a better picture choice. Again, a standard running shot gets elevated. 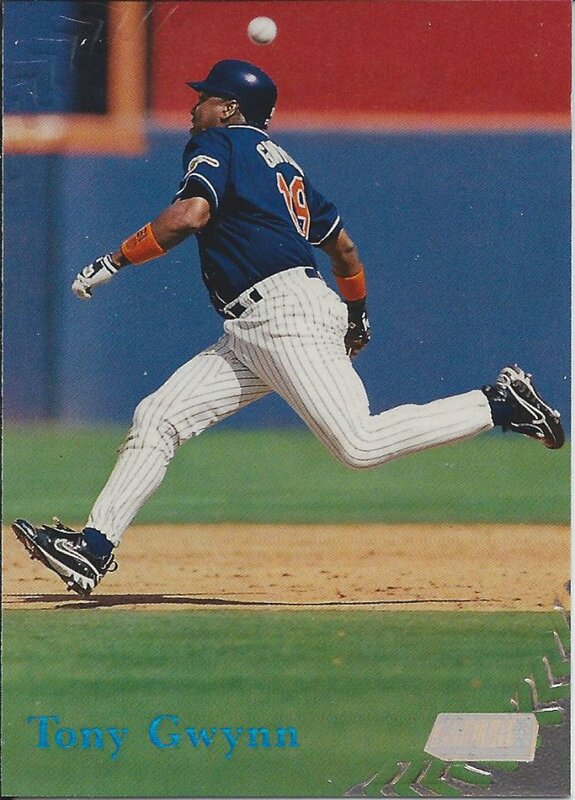 With the ball above the head and no view of the base, I would have to guess this will be an out. This is from the Stadium Club Dome, which might have been a members only type of thing. I’m not too sure, really, but the dome itself looks awesome. All I know is that I recently bought this off of Sportlots with some of my building credit that’s been unused for years. Lastly, how can you not include a Members Only card. This is a Members Only 50 insert thing. To be honest, I have no idea if this was just for club members. 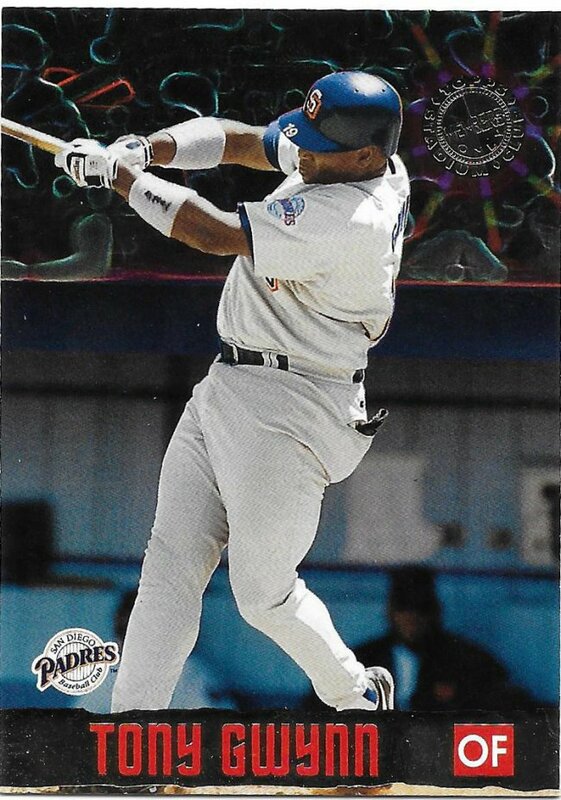 Topps tended to use that label for stuff that appeared in packs too. Either way, it’s interesting and I don’t recall ever seeing this before. 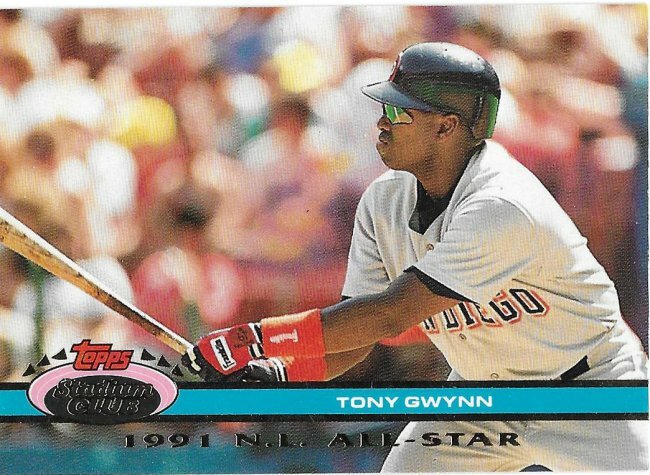 I also nabbed the Frank Thomas one, but we’ll have to wait until he enters the Club. I’m sure they’ll let him in, whether he’s a member or not. Members Only Club? Completely missed the news. Oh well… I probably wouldn’t have joined anyways. I am interested in finding out about the exclusive autographs though.